Finally the playoffs are here. The interminable slog of the regular season is in the rear view and we’ll finally be treated to actual consequential, thrilling, exciti— aw crap, the Spurs are playing the Grizzles. Terrific, another playoff series against the franchise Spurs fans view the way fans of other teams see the Spurs. Oh great. Them. This’ll be a blast. This is going to be controversial, but I don’t care. I truly don’t. 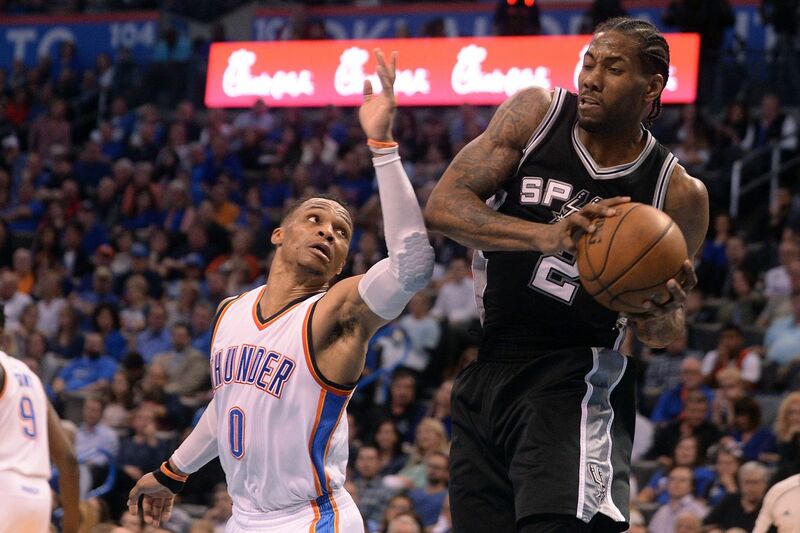 While I’d be happy for Kawhi Leonard if he won it, I can’t sit here and make a definitive case for him, anymore than I could for Russell Westbrook or James Harden. It’s just too close to be bothered or offended by the results. One guy’s got the counting stats, one guy’s got the analytic stats and one guy’s got the defense-and-winning argument. It just doesn’t matter to me. And I’m here to convince you that it shouldn’t matter to you either. You’ve got to look at this season’s MVP award for what it is: A shiny trinket. A historical footnote. It’s a fancy diversion designed to divert your attention from the elephant in the room, which is that the MVP has never been less relevant in determining this season’s champion. It’s akin to asking who between Malcolm Brogdon and Dario Saric will have more influence in winning the title. Well, in that case we should call this MVP “the best non-Warrior award” because essentially that’s what it is. Kevin Durant’s decision to migrate to a 73-win team has thrown the competitiveness of the league so out of whack that it’s rendered individual awards moot. What difference does it make for the voters to select among Leonard, Harden and Westbrook for the award when in any match-up against Golden State, the Dubs will have four of the best five players on the floor? Even if one were to concede that Leonard, Harden and Westbrook were each individually better —or “more valuable,” whatever the hell that means— this specific season than any individual on the Warriors, the Dubs have two superduperstars in Durant and Stephen Curry who’ve accounted for the past three MVP’s, plus someone in Draymond Green who combines Leonard’s defense with Westbrook’s ability to procure triple-doubles and another dude in Klay Thompson who’s liable to go off for 40 every so often. What’s it say about our MVP candidates when in any given game against the Warriors they can be overshadowed by any of four different guys? It’s like debating the merits of Karl Malone vs. Charles Barkley vs. David Robinson as MVP only they’re about to face the 1995-96 Chicago Bulls and oh-by-the-way let’s give the Bulls Reggie Miller for good measure. All we’re doing here is rewarding some guy who doesn’t have incredible teammates and punishing the ones who do. That doesn’t mean that I’m here advocating for Durant, Curry or Green to win the MVP. Far from it. I’m just saying it no longer matters. The debate is just a way to distract you, the basketball fan, from the reality that the playoffs may in fact be quite brief, quite anti-climactic and quite boring, at least in any series involving the Warriors. The talent is just stacked so overwhelmingly in their favor. With all that said, you may have deduced that I’m somewhat nihilistic about the Spurs chances. And I am, in the big picture. But for the record, I think they’re going to beat Memphis, in five games. I’ll even go so far as to give them a good chance of beating the Rockets in round two. They’re the one “elite” club whom I’m confident the Spurs can score against, even in the crucible of the playoffs when everybody starts paying attention to scouting reports and tendencies and the schedule is no longer a factor. In a way, this season reminds me of 2012-13, when the Spurs weren’t that great and were kind of on fumes by the end, but they lucked into a favorable draw. They got the Lakers in the first round that year, with Kobe Bryant out with a torn Achilles and Steve Nash also injured. Then they faced a sixth-seeded Warriors team that had upset the George Karl-led Nuggets in round one. Andre Iguodala was on that Denver team and Mark Jackson’s offense involved a lot of iso-ball for Curry, Thompson and Harrison Barnes, so they weren’t quite ready for the veteran Spurs just yet, but still it took a tough six games. And after that was the fifth-seeded Grizzlies, who “upset” the Thunder in the other semi-final because Westbrook had suffered a knee injury against Houston in round one. Many prognosticators were picking the Grizzles to beat San Antonio again, not appreciating the vast differences between that edition and the one they faced in 2010-11. I reasoned at the time that the Spurs would have the best three wings in the series and would have an easy time against Memphis. It turned out to be a sweep, though a couple of the games went to overtime. The reality was that the Finals was by far the best series the 2012-13 Spurs played. They raised their game to the level of the competition, and still lost. That they made it that far wasn’t a true indication of the team. The 2011-12 edition was superior, by any objective measure. They just faced a tougher match-up. Marc Gasol and Mike Conley will be formidable to be sure, but between Leonard and Danny Green, I expect the latter to contained somewhat. The Spurs have a bevy of defensive weapons to throw Conley’s way, and he doesn’t have the quickness, dribbling wizardry or Jedi-level pick-and-roll mastery of Chris Paul, the explosiveness of Westbrook or the craftiness of Harden. He’s very good, but he still can be game-planned. The real intrigue in the series for me are the benches. The Grizzlies won two of the four meetings and almost a third because Zach Randolph and Vince Carter have gotten the better of Pau Gasol, Patty Mills and Manu Ginobili. In most playoff match-ups the Spurs will need their bench to vastly outplay the opposition’s to have a chance. In this one they merely have to play them even. Points figure to be at a premium, but Tony Allen will reportedly be out, so that’ll be another break for the Spurs. I still expect them to double-team Leonard heavily, so it’ll be up to the bench shooters plus Green, LaMarcus Aldridge and Tony Parker to make open shots. The thing I’ll be looking for from Leonard is whether he’ll be able to make the right reads and get the ball to the right people without turning it over or forcing up bad shots. That’s going to matter a lot more to me than his point total. It’s possible that David Fizdale could elect to go the alternate route, choosing to “let Leonard get his” and to cover up the other Spurs, but that strategy doesn’t really work with their offense. The bottom line is while I’m pretty dubious about the Spurs ability to come up with enough scoring against certain teams in the field, Memphis is not one of them. It’s not going to be pretty, maybe there’ll be another overtime involved, but yeah, I’ve got the Spurs in five. 1) Boston over 8) Chicago: Speaking of match-ups, this is a terrible one for the Celtics. Jimmy Butler is the best player in the series and Dwyane Wade can always take over a random fourth quarter. Also, Rajon Rondo will be tremendously motivated, facing his former team. I don’t have the guts to pick the upset —the Celtics have too much depth and a huge coaching edge— but I’ve got Boston in seven. 2) Cleveland over 7) Indiana: The Pacers don’t have the shooting to hang in here and even with Cleveland’s defensive lapses, Myles Turner will have to go nuts for this to go past the Cavs in five. 3) Toronto over 6) Milwaukee: This is gonna be a taut defensive series with Giannis Antetokounmpo and Khris Middleton at one end and P.J. Tucker and DeMarre Carroll on the other, but ultimately I think Toronto’s experience, backcourt and deep bench will wear down the young Bucks in six. 4) Washington over 5) Atlanta: Should be a good test of Washington’s maturity. If they’re serious about having a deep playoff run they’ve got to make quick work of a limited Hawks team that doesn’t have much firepower. Wiz in five. 1) Golden State over 8) Portland: It’d be more interesting if Jusuf Nurkic was healthy, but still not overly dramatic. The regular season meetings between these teams were not close. The Blazers don’t have the defense or the frontcourt scoring to keep up here. Warriors in five. 3) Houston over 6) Oklahoma City: The Thunder have more individual talent in Steven Adams, Enes Kanter and Victor Oladipo than Houston’s supporting cast, but the Rockets integrate their role players better and that’s the difference. Also, they just flat out shoot the crap out of the ball. Houston’s small-ball attack renders Kanter unplayable and they outgun the Thunder in five entertaining games. 4) L.A. Clippers over 5) Utah: A terrific contrast in styles but the Clippers are the one team where the Jazz’s usual overwhelming advantage in the middle won’t be as pronounced, and that limits what they can do on both ends. If Utah’s role players can get hot from outside, they can win a couple games, but I’ve got the Clips in six. Sorry, chalk city in round one, but if these series all go the way I think they will, I’ll pick at least two upsets in the next round. Happy playoffs, everybody, and let’s try to not have any injuries or refereeing controversies, okay?